Turn on shower and wash everything off. The key here is that you are not using water when you don’t need it (e.g. while shampooing, soaping up etc). However, you might like to slow your shower down to a mild trickle if you want to wet your soap or wash the conditioner off your hands before soaping up etc. And then, for an even more economical and efficient wash, use the bucket method. The bucket method is very simple. You fill a bucket with water. You fill a jug with water and wash yourself. Fine-grained control is yours! A bucket (plastic or metallic) — our water reservoir. 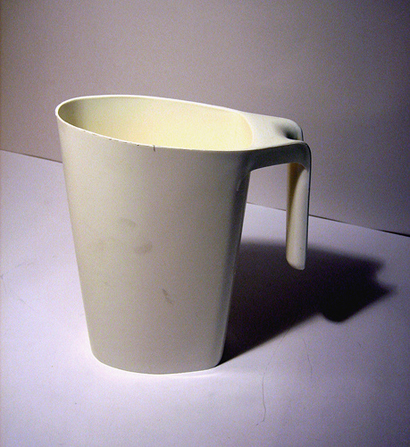 A jug or even a pitcher (plastic or metallic), preferably one with a open handle (like this one) so that you can hang it on the rim of the bucket — our dispenser. A place to wash yourself — a bathtub or a large shower cubicle works well. Fill the bucket with water. How you do this, is up to you. You could use the shower or bathtub tap. Careful with hot water though, it may scald! Also be aware that too hot a water temperature may damage plastic bucket. If you run out of water, just refill it. It helps if you plan so that you won’t run out of water while you shampooing/conditioning. While the bucket is being filled, undress or get your towel ready. Do something productive. Using the jug, pour water all over your head and body ‘til it’s sufficiently wet. Shampoo your hair and soap up. Using the jug again, pour water all over your head and body, rinsing off the shampoo and soap. You might like to keep the bucket sufficiently far away (e.g. an arms-length away) so that the run-off water doesn’t end up in the bucket. Wash your hands (either with a jug of water or a tap/shower if it’s near by). Using the jug again, pour water all over your head and body, rinsing off the conditioner. Wash the bucket and jug if it’s soapy. Although the bucket method takes longer than jumping straight in the shower, it is a great way to save money and water, as everything is optimised.